A hand in which @JonathanLittle does something he almost never does: slow play A-A before the flop.
.@JonathanLittle analyzes a WSOP final table hand in which he tries to get tricky with pocket aces. This week I wanted to share an interesting hand I played at the final table of a World Series of Poker event, a $1,500 no-limit hold'em "shootout" event. It's a hand in which I picked up pocket aces and did something I almost never do with them — just called a preflop raise. There were eight players left. We were at the 6,000/12,000/2,000 level and I had about 900,000 or around 75 big blinds to begin the hand, a stack close to what most of the remaining players had as well. It folded to a tight-aggressive player in the hijack who with about 67 BB to start raised to 28,000, and I looked down at in the cutoff seat. As I explain in the video below, there were a couple of very loose, very aggressive players on the button and in the small blind, which is why I just called the raise rather than three-bet (as I almost always would do). The maniacs to my left didn't get maniacal, though. The button folded and both blinds called, meaning it was four-way to the flop. It checked to the hijack who bet 75,000 (not quite 60 percent of the pot), and the action was on me. I had to decide whether just to call or raise. Watch below and hear me talk about what my range should be in this spot and how that affected my decision how to proceed, and see as well how the hand ended up playing out. Sometimes being tricky as I tried to be here can pay off, and other times it leaves you broke in the gutter. That said, in this spot, this was probably the one way I could have gotten away from this hand without losing most of my stack — if I had been able to fold on the river, which unfortunately I was not. Jonathan Little is a professional poker player and author with over $6,800,000 in live tournament earnings. He writes a weekly educational blog and hosts a podcast at JonathanLittlePoker.com. 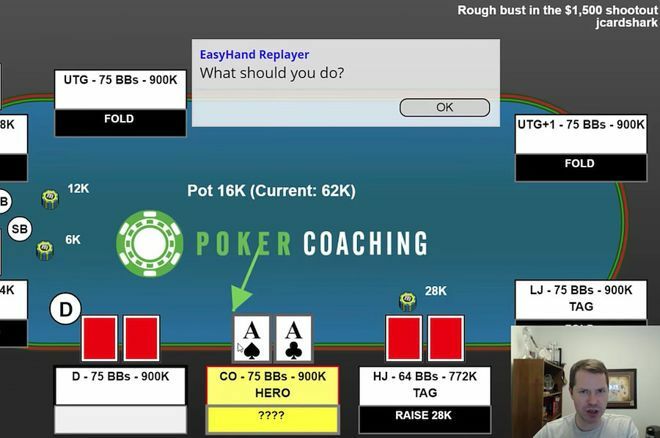 Sign up to learn poker from Jonathan for free at PokerCoaching.com. You can follow him on Twitter @JonathanLittle.